Dorothy believed “There’s no place like home.” Astronomers are looking to prove her wrong. Suburban location. 8-month commute to work. Hot and cold running water. Correction: cold running water. Okay, just ice-cold non-running water, a.k.a. ice. Soil good for gardening, but only with airtight greenhouse and only if you love potatoes, says previous renter Matt Damon. All amenities except air, heat, power. Free NASA TV channel. Quiet. This is how a realtor might sell Mars. Elon Musk calls it a “fixer-upper planet.” His vision of Martian home repair is terraforming – environmental engineering on a planetary scale. Mars is not likely to be a popular timeshare for quite some time to come. Mars is a victim of zoning. Not zoning by a civic authority, but by a much more powerful and far-reaching authority: the laws of Nature. The laws of physics and biochemistry. Mars is outside the Zone – the Habitable Zone, which is the range of distances from a star where the surface of a planet could harbour liquid water oceans. The temperature must be between the boiling point and the freezing point of water. Not too hot, not too cold, but just right. Astronomers nickname it the Goldilocks Zone. For complex life forms (like us), Mars is too cold. Venus is too hot. Earth is just right. Life might exist in oceans beneath the icy crusts of Jupiter’s moon Europa or Saturn’s moon Enceladus or in frigid lakes of liquid methane on the surface of Saturn’s large moon Titan. But unless we wait for Elon Musk’s Global Home Renovations & Terraforming Inc. to upgrade Mars, there’s no place in our Solar System able to harbour life like us, other than Earth. To find other homes of complex life – to find other Earths – we must extend our search beyond the Solar System. That search is already underway. It started almost 40 years ago. And it started at UBC. Thirty years ago, we knew of only nine planets. (Technically, eight, since we nasty astronomers downsized Pluto in 2006.) As I write this, there are 2,107 confirmed planets, and more than 4,000 strong candidates. By the time you read this, the numbers will have risen. New detections are being made weekly, sometimes daily. If you want to keep track of the tally, bookmark the Extrasolar Planets Encyclopedia site. It’s no exaggeration to say that we know of thousands of worlds (exoplanets) beyond the Solar System. But this is only the tip of the iceberg. Actually, since our Milky Way Galaxy contains hundreds of billions of stars and it is one of hundreds of billions of galaxies in the known Universe, it’s an exaggeration to call a sample of a few thousand planets the tip of the iceberg. It’s a tiny droplet of dew on the thinnest frosting of snow at the tip of an unimaginably large iceberg. But compared to the handful of planets known to humanity for centuries, a sample of thousands is a gold mine. We’ve had telescopes since the time of Galileo, more than four hundred years ago, so why did it take so long for this exoplanetary Gold Rush? Planets are small, compared to stars. If the Sun were hollow, you could fit a million Earths inside it. Planets are faint, compared to stars. From afar, the Earth is a billion times fainter than the Sun. And we see exoplanets from afar, orbiting stars so distant that our fastest space probes won’t reach the realm of our nearest stellar neighbours for about a hundred millennia. How do you find something so faint that it’s lost in the glare of a pinpoint of starlight? So small and far that it can’t be photographed? The answer: Use the Force. Not the Force of a Jedi, but the force of gravity. Orbital motions are like dance moves. Two whirling swing dancers joined by their arms are like a star and a planet joined by gravity, where one partner is much heavier than the other. Both partners swing around a point between them, with the lighter one moving in a big arc and the heavier one tracing a tiny loop. The Sun and Jupiter pivot on a point 1,000 times closer to the centre of the Sun, which is 1,000 times more massive than even giant Jupiter. For the Sun and the Earth, the pivot is 320,000 times closer to the Sun. An alien astronomer might discover planets in our Solar System by measuring the subtle “wobbles” of the Sun induced by its unseen gravitational dance partners. When it comes to other solar systems, we are the aliens, and we have applied this approach to other suns. Tracking a star’s wobble on the sky due to planets is challenging, since the changes in angle are so very tiny. Tracking changes in a star’s speed as it wobbles is almost as challenging. The speed of the Sun’s motion induced by Jupiter’s orbit is about 45 kph – faster than Usain Bolt in a 100-metre dash, but slow for a star. The speed of the Sun’s motion induced by the Earth is also about as fast as Usain Bolt, but Usain Bolt when he was a baby, crawling at only 9 centimetres per second! Measuring the planet-induced wobble in a star’s speed was a very daunting challenge. Two Canadian astronomers – one a UBC professor – rose to that challenge in 1978. Gordon Walker (UBC professor emeritus) and Bruce Campbell (a postdoctoral fellow at the University of Victoria at the time) wanted to discover planets. The best instruments of the day were not up to the task, so they designed and built a stellar “speedometer” 40 times more precise than the best in existence at the time. 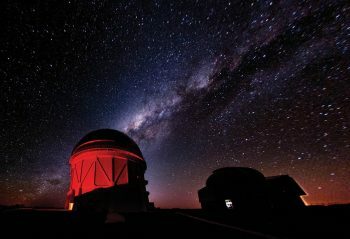 They took their instrument to one of the largest telescopes in the world, atop the summit of the tallest volcano on Earth (Mauna Kea, on the Big Island of Hawaii) to hunt for planets around a sample of 16 Sun-like stars. They saw a wobble in the star gamma Cephei (in the constellation Cepheus, King of Aethiopia in Greek mythology), moving back and forth every 2½ years due to a planet in an orbit twice the size of Earth’s. The planet is almost twice the mass of Jupiter, but in an orbit less than half its size. Nobody expected a giant planet so close to its sun, so like good scientists – and typical Canadians – Walker and Campbell were cautious and modest. They reported the signal in 1988, but didn’t claim a definitive planet detection. Four years later, measuring wobbles with radio timing data, two astronomers reported planets around a pulsar, the rapidly spinning “corpse” of a star that died in a supernova explosion. Seven years after Walker and Campbell discovered the first planet outside our Solar System, another pair of astronomers found another planet around a Sun-like star. In the textbooks, these are listed as the first discoveries, but exoplanet hunters acknowledge that Walker and Campbell were at the frontier years ahead of anyone else. The pioneering work of Walker and Campbell in the 1980s paved the way for hundreds of exoplanet detections in the late 1990s and beyond. Measurements of the wobbles of stars accounted for most of these discoveries. But the dawn of the new millennium saw the dawn of another generation of planet hunters: transit hunters. If you say the word “transit” to a person on the street, they will likely picture buses, trains, and subways – a public transportation system. But if you say “transit” to an astronomer, she is likely to picture a planetary detection system. A transit is like a solar eclipse, except the bright disk of the Sun is not totally covered. From Earth, we can witness rare transits of the Sun by Venus and Mercury. We can also witness transits of stars by exoplanets but only if the planet’s orbit is aligned with our line of sight. We can’t see the planet against the star, since the star is just a pinpoint of light. Instead, we look for the subtle dip in the star’s brightness every time the planet partially covers its disk. Planet hunting by transit is like playing the lottery. The more tickets in your pocket, the better the odds of having a winner. In a transit search, the more stars in your sample, the better the odds of having ones with planets in the right orbits to be seen in transit. But unlike most lotteries, every winning ticket in the transit lottery – every detection of a new planet – is like winning the jackpot. The biggest player in this game is NASA’s Kepler mission, named after German mathematician Johannes Kepler, who in the 17th Century first showed how planets orbit the Sun. The Kepler space telescope stared at about 150,000 stars in a small patch of the sky for four years, looking for periodic dips in the brightness caused by transiting planets. Kepler discoveries account for half of currently confirmed exoplanets. It’s a universal law of the Universe that, when you look at it in a new way for the first time, you always find things you never expected. The same law applies to the search for exoplanets. We used to think that our Solar System was typical and that most planetary systems would have planets in nearly circular orbits (with periods of months to years); two sets of planet sizes: “terrestrial” (with Earth as the largest example) and “giant” (at least four times the diameter of Earth); and gaseous and icy giant planets far from their suns, with smaller rocky and metallic worlds closer in. But the earliest exoplanet discoveries were surprises. Astronomers discovered giant planets – “hot Jupiters” – orbiting 20 times closer to their suns than Earth is to ours. As discoveries mounted, so did the surprises. We found cigar-shaped orbits carrying planets far from a star and then just above its surface, causing extreme weather cycles I call “climate rollercoasters.” We recognised a new class of planet – “super-Earths” – with sizes and masses between Earth and Neptune, with no analogue in our Solar System. There are even planets orbiting binary stars, where you’d witness twin sunsets like Luke and Anakin see in Star Wars movies. In fact, they’re called Tatooine systems, as a tip of the space helmet to the Skywalkers’ home world. Science is catching up with – and even overtaking – science fiction. 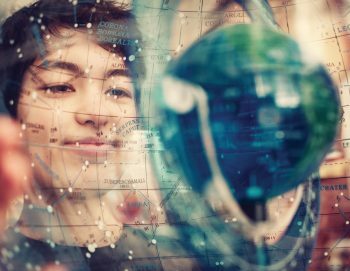 The modern story of exoplanet discovery started at UBC, and UBC continues to be a centre of exoplanet research and discovery. UBC is marking its Centennial. Looking back at the last century, I’m often asked to forecast the directions science and education will take at UBC in the next century. To answer that, I don’t need a time machine to visit UBC’s 2116 graduating class. I see the future in this year’s graduating class. Consider Michelle Kunimoto, undergraduate Physics & Astronomy student. In her ASTR 449 course – where a student partners with a professor to conduct research, for credit and career experience – Michelle is looking for planets in Kepler satellite data. Michelle is a Star Trek fan, but she’s not boldly going where no one has gone before. She’s boldly going where experts have been already, to find planets they may have missed. Michelle sifted through 400 Kepler light curves (stellar brightness measurements v. time) where NASA’s team had found exoplanets or false alarms. She independently “rediscovered” the hundreds of planets already seen in the data, and the dozens of false alarms. She also found 23 additional signals. Reality checks narrowed this to four planets – one smaller than Mercury, two Earth‑sized, and one slightly bigger than Neptune. The last of these, known as KOI (Kepler Object of Interest) 408.05, is a “warm Neptune” in the Goldilocks Zone of its star. 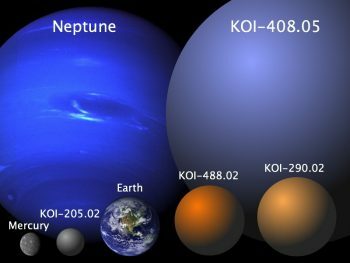 A planet of this size is unlikely to have oceans, even if its surface temperature is in the liquid water range. But giant planets in our Solar System have large moons. If KOI-408.05 has a large moon, then it could harbour oceans, and maybe life. Ever see a movie called Avatar? The world Pandora – you know, the home of the big blue aliens with long tails and unruly hair – was not actually a planet, but a large moon of a giant planet in its star’s Goldilocks Zone. It’s great to have on your resume “B.Sc., UBC Honours Physics & Astronomy.” Imagine being able to include “Discovered four alien worlds, including a system that might harbour life.” That would have been a fantasy when I was a student. It’s a reality for Michelle Kunimoto and a thrilling prospect for other UBC students today. In the land of Oz, Dorothy Gale clicks the heels of her ruby slippers and says to herself “There’s no place like home.” At UBC, Michelle Kunimoto clicks the keys of her grey computer and says to herself “I wonder if there’s a place like home” somewhere else in the Galaxy. She’s still looking. Stay tuned. The KOI-408.05 research has been submitted to the Astronomical Journal and the authorship list of the paper spans three generations of a UBC family tree. Kunimoto, a UBC undergrad, is first author. Her professor, Dr. Matthews, is second. The 3rd and 4th authors are UBC alumni. Dr. Jason Rowe was Matthews’ PhD student, and Dr. Kelsey Hoffman was a fellow grad student. Jason and Kelsey met at UBC and are now husband and wife. 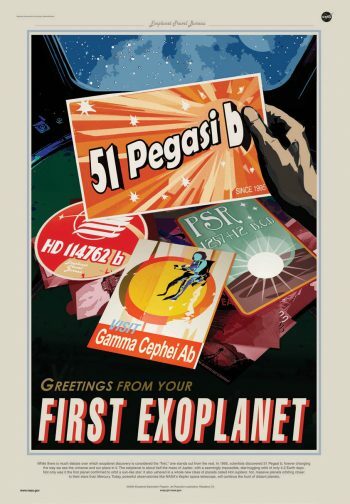 The banner image is a detail from a vacation poster by the Exoplanet Travel Bureau. The poster and the bureau are fictional but the destination is real. Kepler-186f is the first Earth-sized planet discovered in the “Habitable Zone” around another star, where liquid water oceans could exist on the planet’s surface. Its star is much cooler and hence redder than our Sun. If plant life grows on Kepler-186f, photosynthesis there may have adapted to red “sunshine,” producing a colour palette that’s different from the garden greens of Earth. 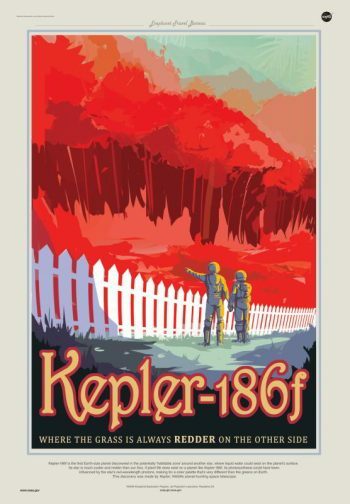 Kepler 186f is one of thousands of planets discovered in the last three decades. 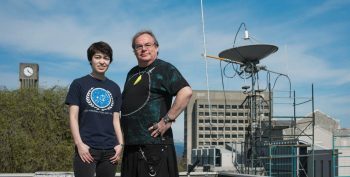 As Canadian astronaut Chris Hadfield floats through the cosmos, a UBC psychology student is working to keep him connected to Earth. Along with 4,000 other hopefuls, Gavin Tansley applied to become one of Canada’s next astronauts.